Sometimes tattoos no longer hold the same meaning or importance to us as they once did. There are lots of tattoo cover up options however when a tattoo you no longer want effects your daily life, removal maybe your best option. Dr. Darshan Shah of Bakersfield, CA saw an increasing need of tattoo removal for visible tattoos and began offering free laser tattoo removal hoping to help people that have experienced difficultly finding employment because of these tattoos. His only requirement is that for the tattoos he erases, a person cannot otherwise cover up tattoos by clothing. 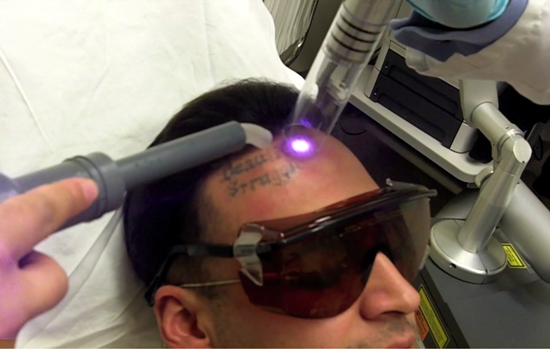 Normally, Shah charges $300 for each laser session and it takes up to six sessions to remove a tattoo. A Kern County court advocate says that employers in the conservative county don’t view tattoos positively. The first client to benefit from Shah’s service has tattoos representing past gang affiliations. But the first one he wanted removed was a former girlfriend’s name inked above his eyebrow. He is getting married next year – to someone else.